While I thought this was a tasty dish, I felt like it lacked flavor. There just wasn’t enough sauce to go around, as 1.5 TBS hoisin sauce, 1 packet soy sauce, and 1/2 tsp of chili garlic sauce made just a tiny bit. If I made this again, I would probably add at least an extra tablespoon of hoisin and probably a quarter cup of soy sauce. Maybe I just like things saucy? Plated said this would take 35-45 minutes, it took me 49. 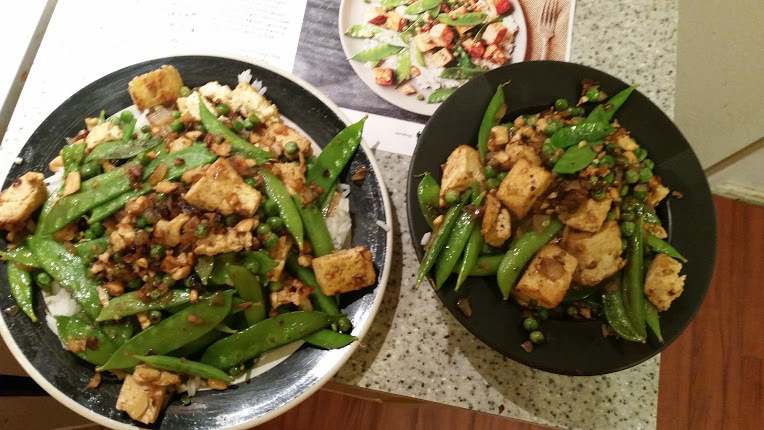 This is the second time I’ve had tofu from Plated, I’m still struggling with the best way to drain and cut it. This time I put it on two paper towels on a plate, then put two more paper towels on top, then put my Kitchenaid mixer on top of that. But it is still really crumbly and impossible for me to cut into perfect cute little squares. 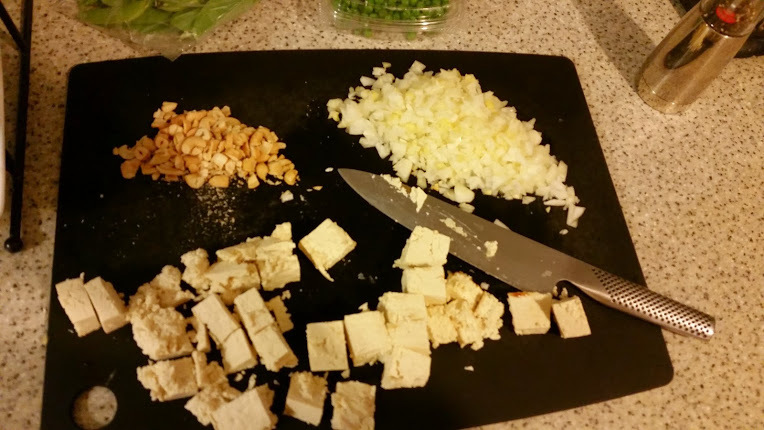 Not too much chopping in this one, just the tofu, cashews, onion, garlic, and ginger. 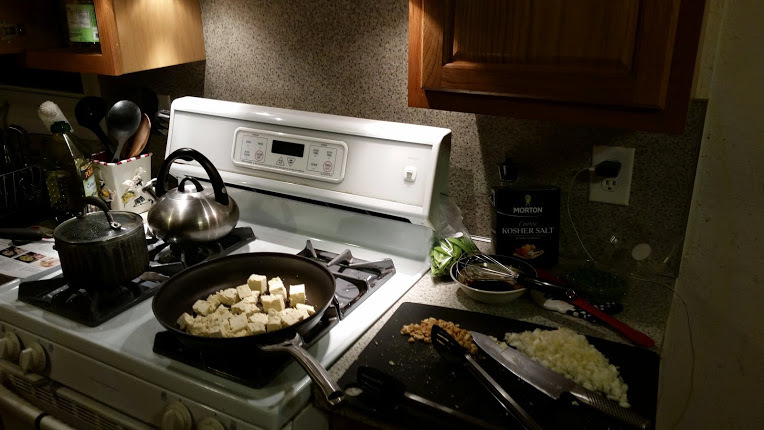 The most labor intensive part with exception to chopping was cooking the tofu, and turning it to make sure all sides were brown. All in all, a decent dish, but as I said earlier, could have used more flavor. Him: Woah…cheese steaks!! Yes, that would be awesome, we would have to go to the store. Would you rather do that Saturday as a together thing. 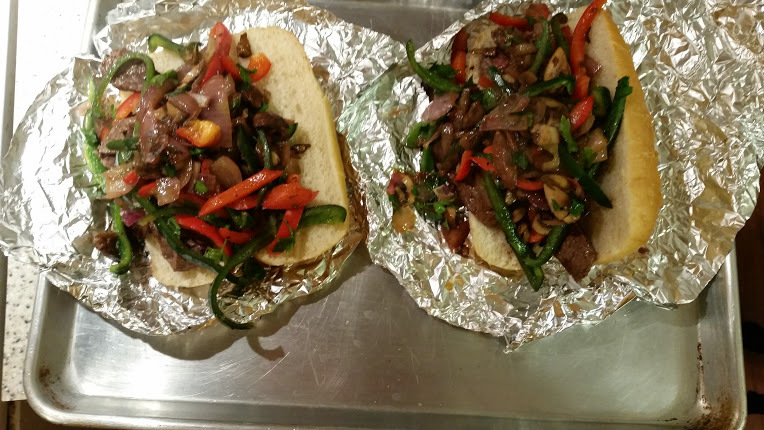 Me: We have Plated cheese steaks, but we can make our own on Saturday together if you want. 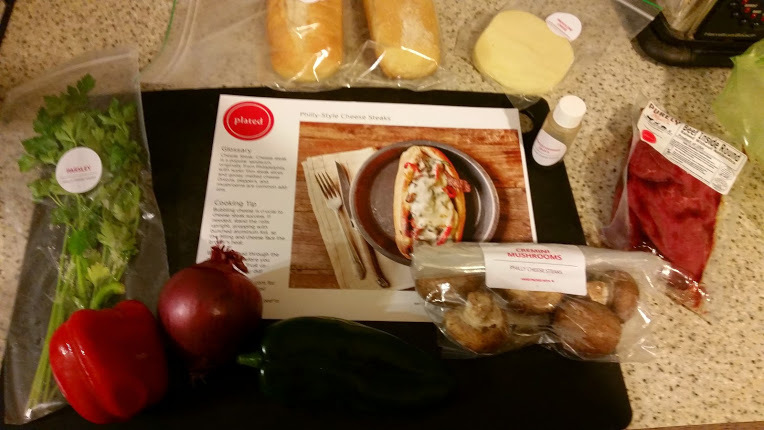 Plated uses real cheese. You see, my husband’s family is from Philadelphia, and his Nana still lives there. While he is kind of a food snob in many ways, he prefers canned fake cheese on his cheese steaks. Personally I think he’s crazy, but to each his or her own. Anyways, this was another delicious meal. Hubby even said “I could eat this twice a week for the rest of my life”. It was that good! 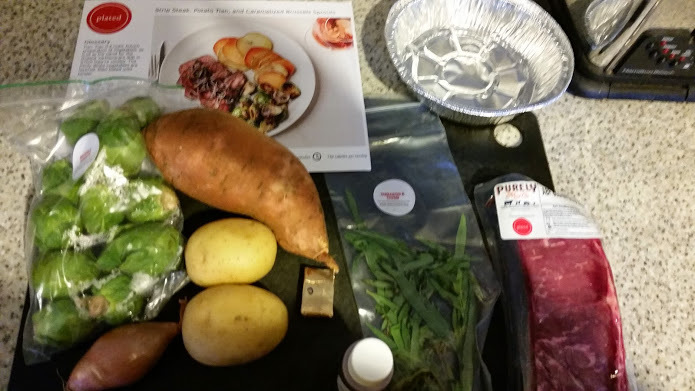 It took me 41 minutes, just 1 minute over Plated’s 30- 40 minute time estimate. Most of that time was spent chopping. SO MUCH CHOPPING! 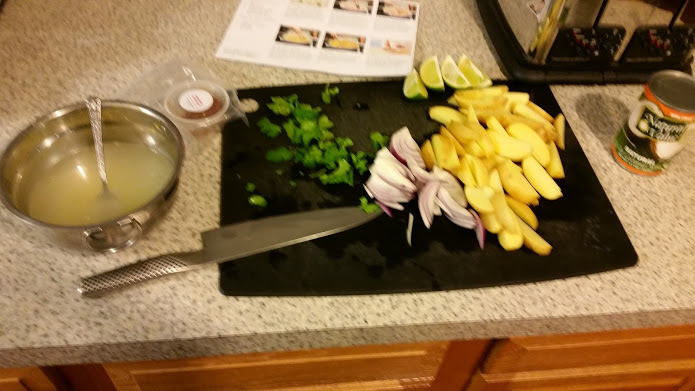 I think I might be holding my knife wrong, my index finger started to hurt halfway through, I’ll ha ve to ask my husband to watch next time so he can tell me if I’m doing it wrong. I felt like there was a lot of dishwashing in this one, too. Two cutting boards, 3 knives, two pans, a baking sheet, a measuring spoon, tongs, and a spatula to stir. It felt like there was a lot going on at the same time in this one recipe, I had to be cognizant of 2 pans as well as the rolls being warmed in the oven. This recipe required the broil setting of my oven, which I have never used before, so I looked it up. In baking, the heat comes from the bottom of the oven. In broiling, the heat comes from the top. 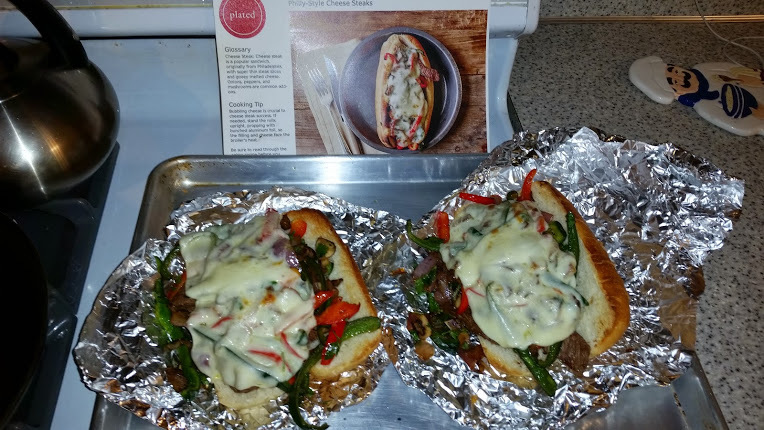 Makes sense for these cheese steaks, because everything else is already cooked, you are just trying to melt the cheese. I was really happy that Plated included 4 pieces of cheese instead of the 3 it listed in the recipe, it was nice to be able to just put 2 slices on each. 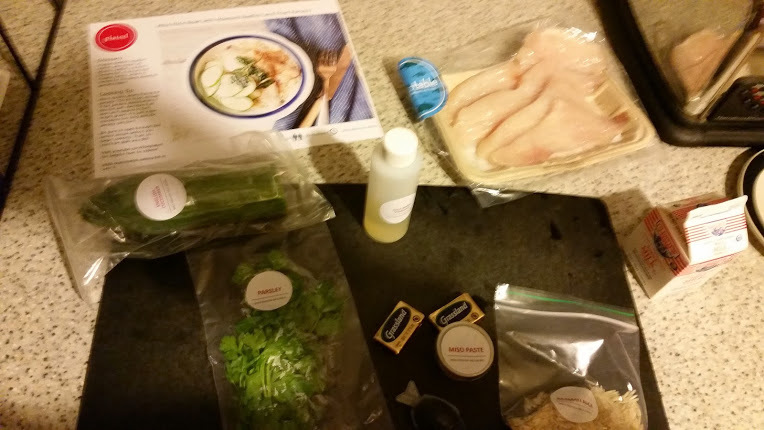 The Miso Rice Bowl with Roasted Redfish and Fried Parsley was another delicious meal from Plated. 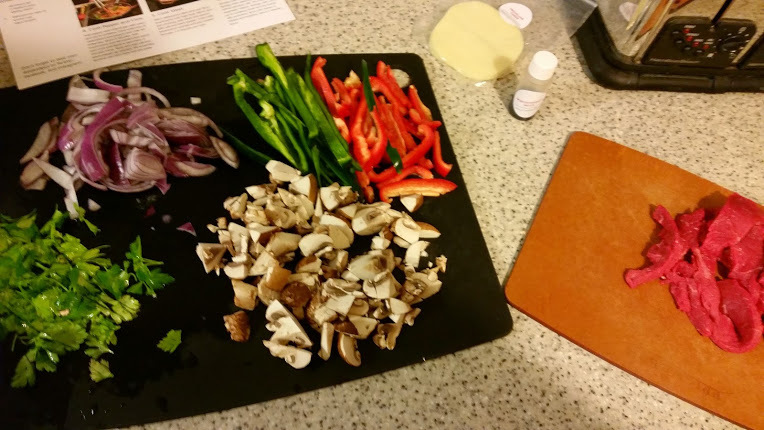 This was probably one of the EASIEST meals thus far, and definitely had the least amount of chopping. 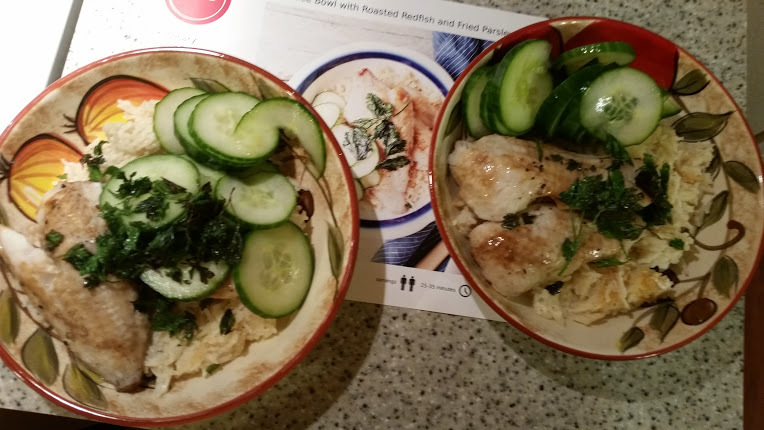 I only had to chop the cucumber and pull the leaves off the parsley, which helped speed things along. It took me 36 minutes from packaging to plate, so only 1 minute over the 25-35 Plated told me it would take. 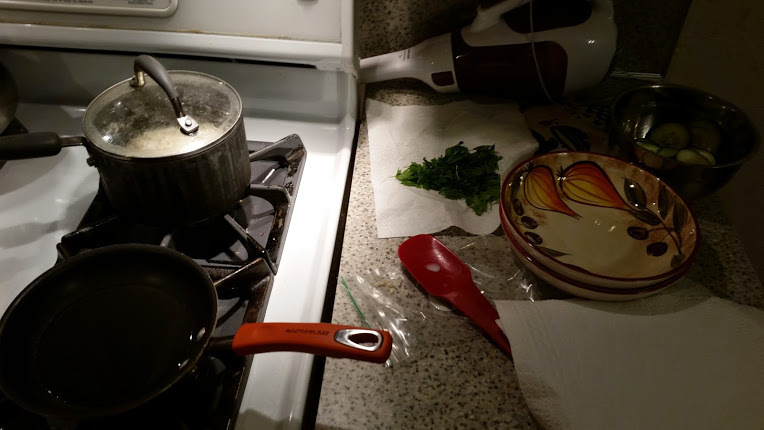 I was also able to wash dishes and do a few household tasks during the process. I can see myself using the same cooking techniques in the future. 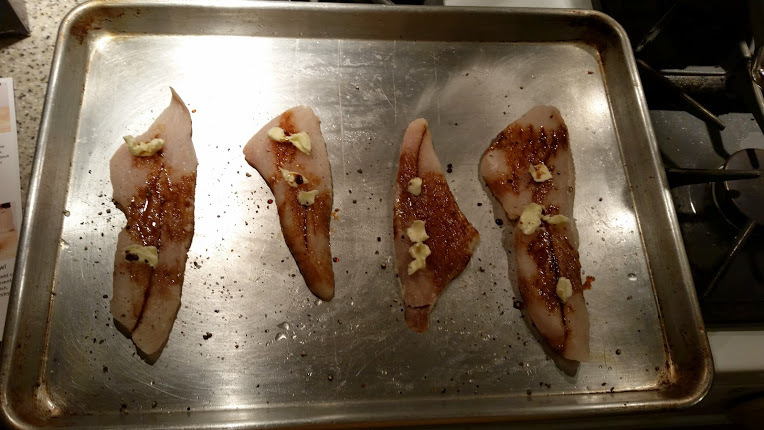 I’ve never dotted butter on fish before, you literally just put globs of butter on fish. I also thoroughly enjoyed the pickled cucumbers. Just cucumber + kosher salt + 1/2 cup of rice wine vinegar + 10 minutes wait. Great for a quick snack! Here’s a picture of the first batch of parsley frying, sorry it’s so dark! I would have never thought to fry parsley without Plated telling me to. At 580 calories per serving, this was a nutritious and healthy meal. Bonus for me – my husband wasn’t very hungry and I got to eat his cucumbers and a little bit of extra rice. Lucky me!! 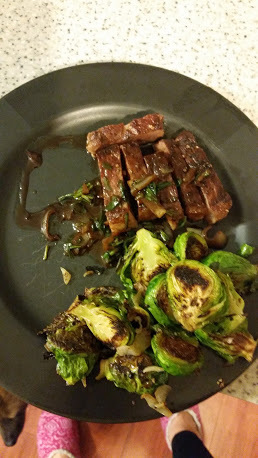 I made the Strip Steak with Potato Tian and Caramelized Brussels Sprouts Sunday night, and it was another great dish. Also, I learned that it is not “brussel sprouts”, but “Brussels sprouts”. Good to know, been saying it wrong for decades. Thanks spellchecker! Anywho, I had big problems with the timing of this. 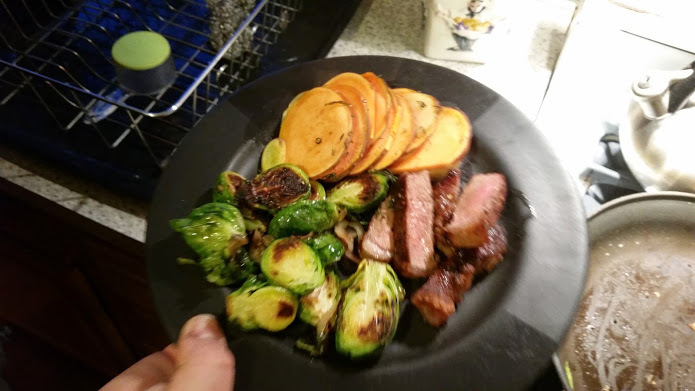 The tian needed longer than 30 minutes in my oven, and was done after my husband and I had finished our Brussels sprouts and steak. Even so, it was a delicious meal. 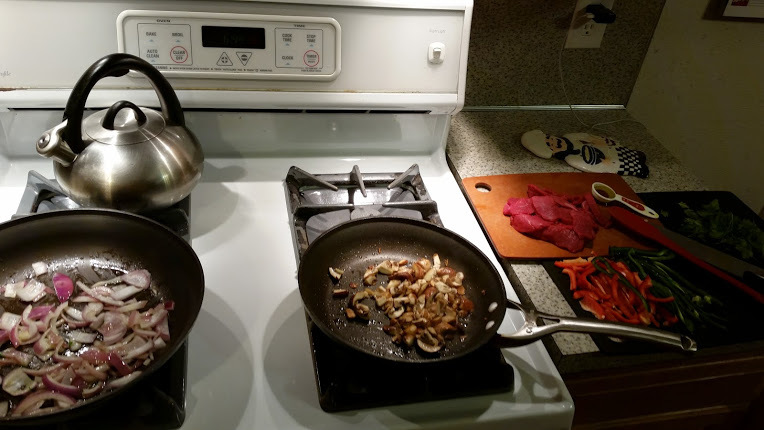 Hubby helped with most of the chopping while I prepped everything else. 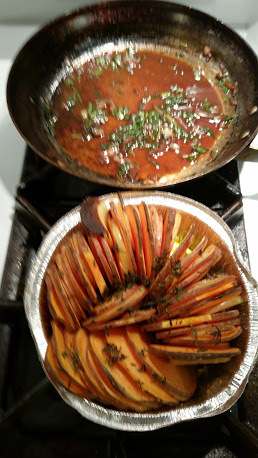 With both of us, it took 45 minutes, not including the extra 15 minutes we cooked the tian. I blame the giant sweet potato! Recipe said it would take 40-50. No new cooking techniques in this one, although I did learn that what a tian is, a “rustic French preparation of vegetables as well as the name for the shallow earthenware dish in which they are cooked”. I was very glad Plated included the aluminum tian, because I definitely did not have one on hand. 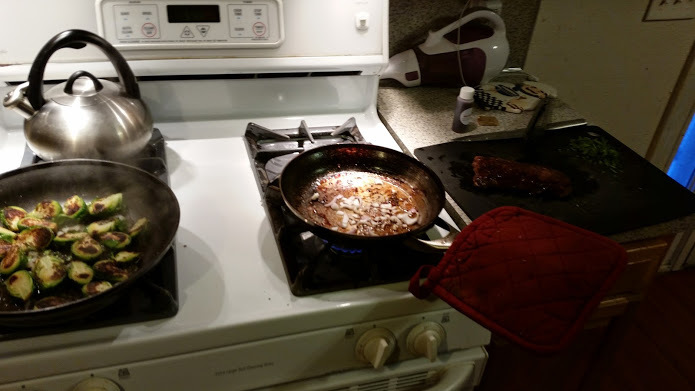 I was terrified of burning myself on the pan that had been in the oven with the steak, so I put a potholder on it. I felt like there was a lot going on at the same time. I had to be mindful of the tian (which ended up needing more time), the sprouts, the sauce, and the steak all at the same time. I had 4 different mental timers in my head set to go off at different times. Here is the tian after I took it out of the oven (the first time) along with the yummy red wine sauce. I think that the sweet potat o was just too big, and that’s why it took so long. I made one finished plate, before tasting the potatoes and putting them back in the oven. And here is my sad tianless plate, as well as my feet and my dog’s nose. The potatoe s were delicious when we were finally able to eat them, but I would have liked being able to eat everything together. Overall, it was a good dish, and I would order it again if it was available. 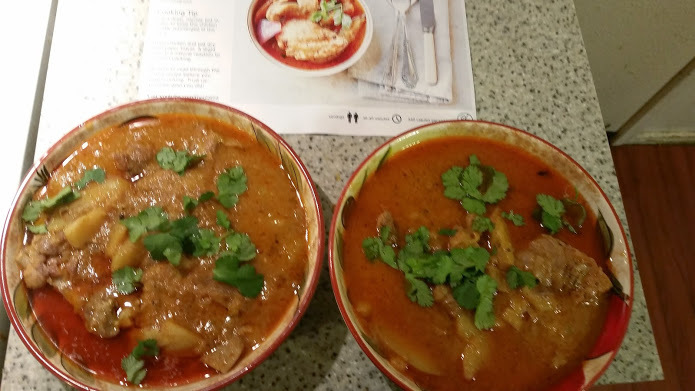 Friday night I made Braised Chicken with Potatoes and Massaman Curry. It was spicy and quite tasty! Unfortunately I messed up the curry sauce, I didn’t measu re my oil and used too much, so it was quite oily. But it was still delicious. It took me 1 hour and 8 minutes, definitely not the 30-40 minutes Plated told me it would take. I th ink those are maybe the times of professional chefs? I’m getting better at chopping, but it still takes me a while. 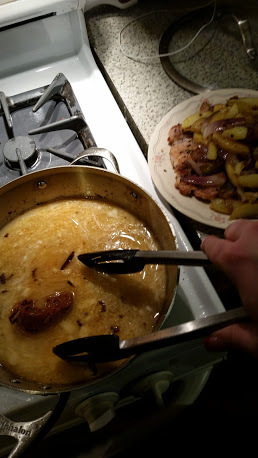 If I made this again, I’d measure the oil, as well as slice the chicken into bite size pieces for ease of eating. 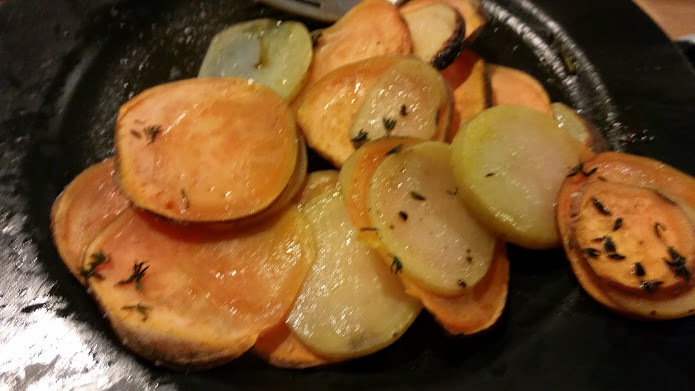 There was a bad piece of potato which I did not appreciate, but it was easy enough to cut out and not eat. I am so thankful that my husband insists on good knives. They aren’t cheap, but make my job much easier. I hate touching raw chicken. It totally icks me out. Just look at it!! One thing that surprise me was the coconut milk. 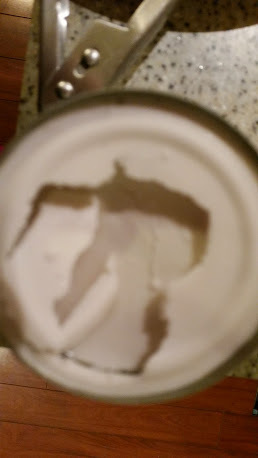 I actuall y HATE coconut with a passion, and was worried about this being in the recipe. Luckily it was overpowered by the other flavors and I couldn’t taste it at all. But look at it. It was all congealed and globby. I also thought that the color was totally off compared to the picture. In the picture, it’s much more yellowish, not the dark reddish orange I got. Not a big deal, just different. Here is the finished product, as you can see, it’s extra oily, which is totally my fault and should not be blamed on plated. 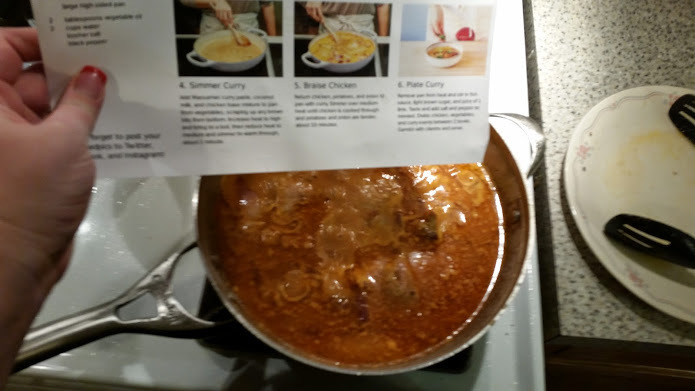 It tasted really good, I really liked the heat the curry provided. 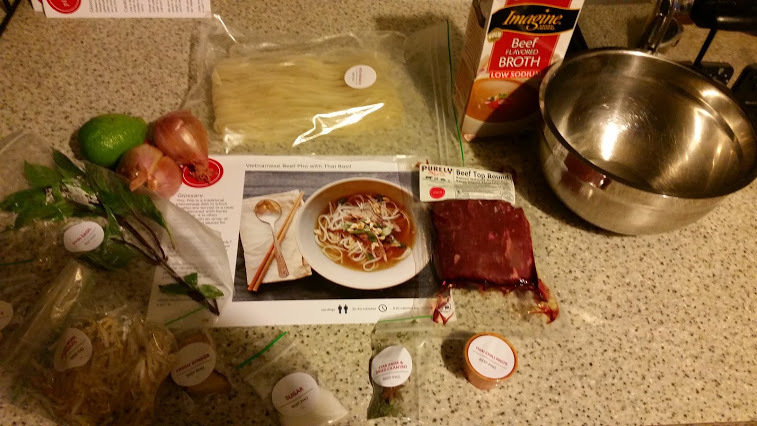 Last night I made Plated’s Vietnamese Beef Pho with Thai Basil. 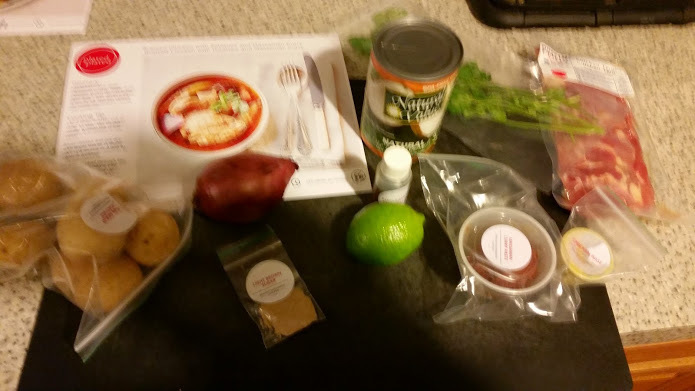 It was the first meal I made from Plated that I just didn’t like. 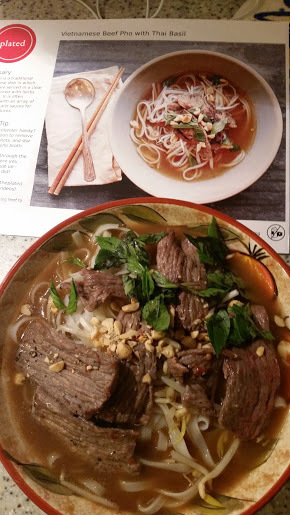 I didn’t think that the meal was nearly flavorful enough, and despite following directions, the rice noodles were too chewy and bland. The recipe said it would take 30-40 minutes, and it took me 31. 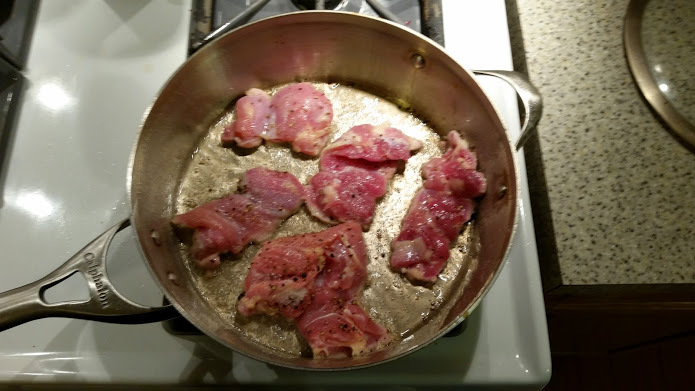 I did marinate the meat for 30 minutes, so I sliced that and put it in a bowl with the Thai chili paste and sugar prior to starting the timer. 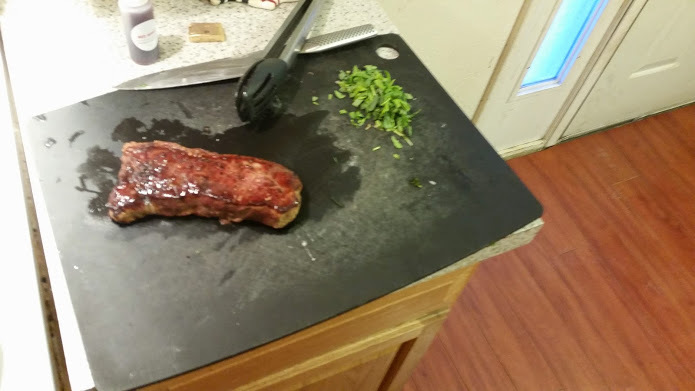 Not too much chopping in this one, just what you can see on the cutting board. 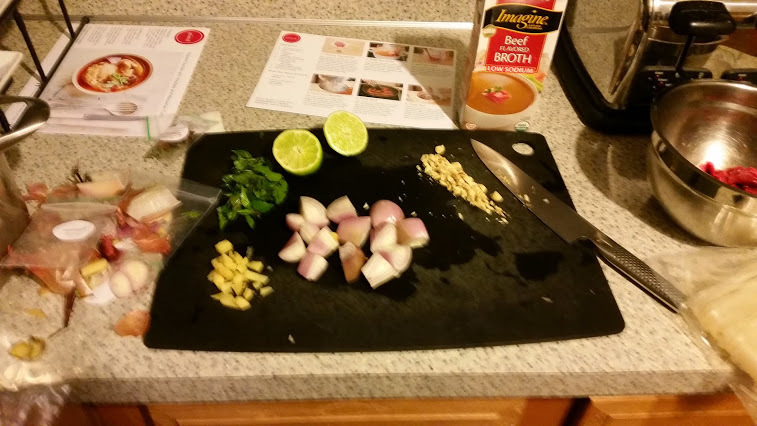 Thai bas il, peanuts, lime, and big pieces of shallots and ginger. 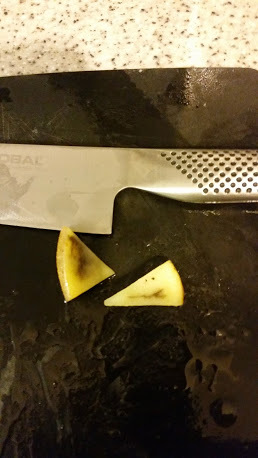 I actually sliced the ginger too small, it was harder to strain out later, but it still was good. 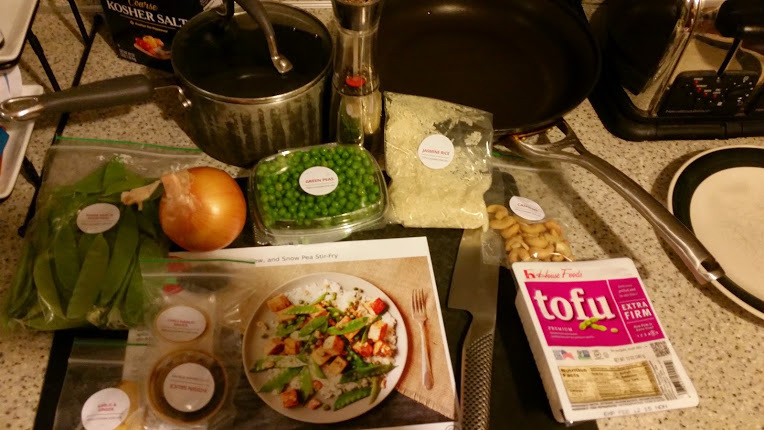 The oddest part about this recipe for me was cooking noodles in a bowl. 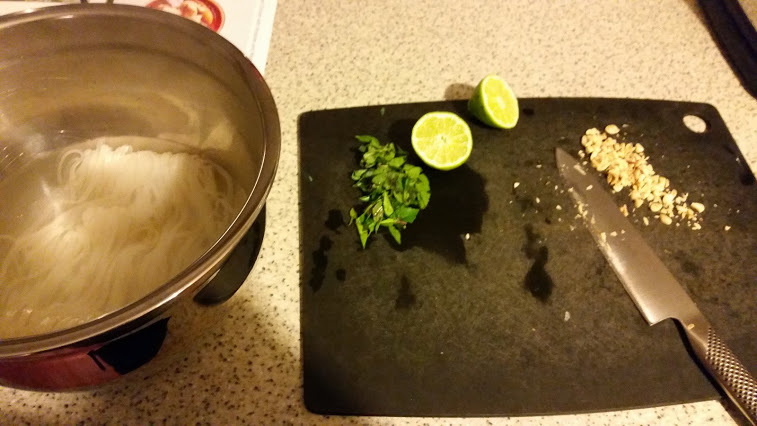 The recipe called for the noodles to be put in a bowl, then boiling water poure d over them. Honestly, I think this is why I didn’t like the noodle texture, it just didn’t taste like they were done enough. Also, I didn’t like that the broth was poured over them at the end. I think that they would have tasted a lot better if they had been cooked in the broth, or at least been able to soak up the yummy flavors.